Unlike the USA, Canada does not have an Energy Information Administration. While valuable data is provided by government sources such as Statistics Canada, National Energy Board, Natural Resources Canada and Environment Canada, the information is often incomplete and disconnected. To fulfill this need, CESARNET.ca has been working with whatIf? Technologies Inc, an Ottawa-based computer modelling company to integrate all these data sources into a version (V7) of their Canadian Energy Systems Simulator (CanESS) model. 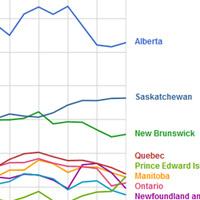 The model outputs the stocks and flows of energy and carbon associated with fuel and electricity production and use in Canada and its provinces. Of course, the flows of carbon are critical in determining the greenhouse gas emissions associated with Canada’s energy systems. In this portal, we are pleased to provide access to many years of highly integrated data on the energy systems of Canada and its provinces. We have used Google Public Data Explorer and D3’s Sankey plugin to provide these visualizations. CanESS draws on the historical data to calibrate a powerful technology- and behaviour-rich energy systems model depicting the stocks and flows of energy and carbon in Canada. CESAR is currently using the CanESS model and other tools to envisage, characterize and quantify future flows of energy and carbon associated with fuel and electricity production and use. 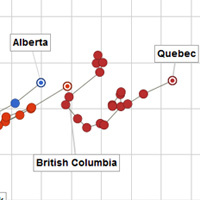 It is our hope that these visualizations will improve understanding and elevate the conversation around the energy systems and energy systems change in Canada. 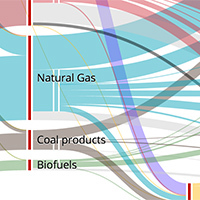 This visualization gives access to thousands of Sankey diagrams depicting the flows of energy or carbon, by province or nationally, associated with fuel and electricity production and use from 1990 to 2013.